FB Hotel & Convention Center Now Open! 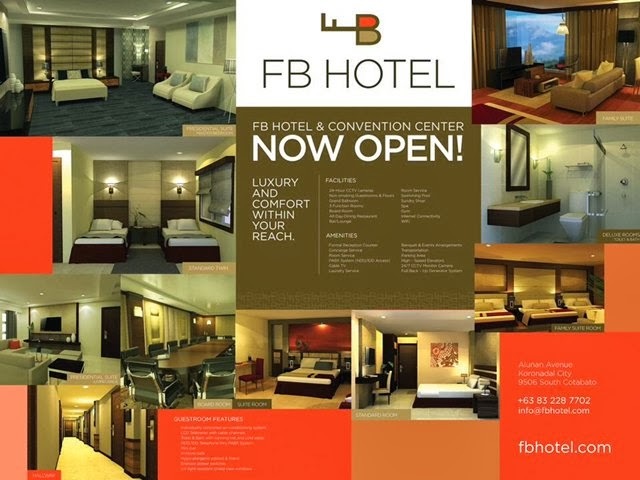 FB Hotel & Convention Center (initially named as Benlyn Hotel during its construction stage) located at Alunan Avenue, City of Koronadal is NOW OPEN! A four (4) storey accommodation facility, FB Hotel & Convention Center is very accessible. It is just few meters away from Protech Center, the Provincial Capitol of South Cotabato and is still within Koronadal City's business district.